UPDATE: According to our own calculations, these dimensions are wrong. Check out our new LG G3 size comparison against rivals. The LG G3 is undoubtedly shaping to be a premium smartphone, with its speculated 5.5" Quad HD display, Snapdragon 801/805 processor, 3 GB of RAM, microSD slot, and an optically stabilized camera. A high-end smartphone from a major manufacturer usually commands a premium price tag, and if the latest pricing scheme leak about the G3 is to be believed, that will indeed be the case with LG's finest. What we will be getting for the money seems enticing enough already, but the newest case leak, of Spigen Slim Armor, reveals that the outer shell also has something going for it. 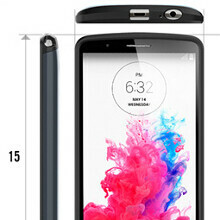 Spigen lists the dimensions of the G3 with its own case tacked on, and when the source subtracts the shell's approximate thickness, they arrive at a roughly 5.58 x 2.87 x 0.37" (141.8 x 73 x 9.3 mm) compact chassis. For comparison, the G3 might be close to the Galaxy S5's dimensions, despite having a much larger display diagonal. This seems to stem from the shrunk top and side bezels, so we could be looking in an excellent screen-to-phone-size ratio with the G3, just as it was with its predecessor, the G2. Spigen also lists a number of other cases and screen protectors in its portfolio, made specifically for the G3, so the announcement next week seems imminent indeed, and we'll have boots on the ground to relay the G3 festivities. There's an update to the article.! No, it needs to be 173cm... Just kidding. I hope the sales are high for the G3 this year. some LG fans did not buy G2; reason is LACK of micro SD card slot and NON REMOVABLE BATTERY. now its the right time to buy G3! And many of the g2 users will switch to samsung or apple for various reasons.! Just putting a pen doesn't make it a Note competitor. Note's stylus is deeply integrated in TuchWiz. We'll have to wait and see. Gosh, such a beautiful device.. but I just wish it comes with the S805.!! Fingers crossed..